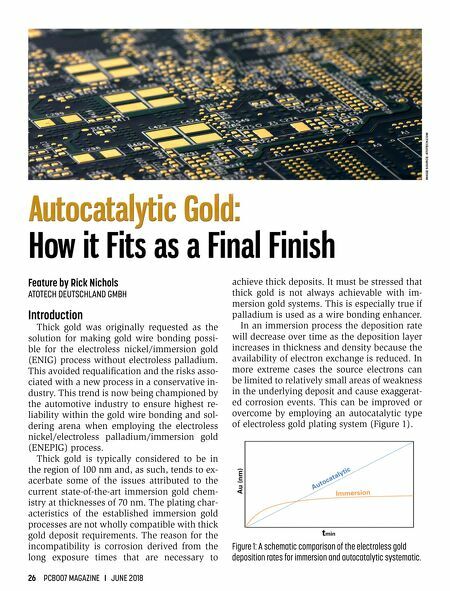 26 PCB007 MAGAZINE I JUNE 2018 Feature by Rick Nichols ATOTECH DEUTSCHLAND GMBH Introduction Thick gold was originally requested as the solution for making gold wire bonding possi- ble for the electroless nickel/immersion gold (ENIG) process without electroless palladium. This avoided requalification and the risks asso- ciated with a new process in a conservative in- dustry. 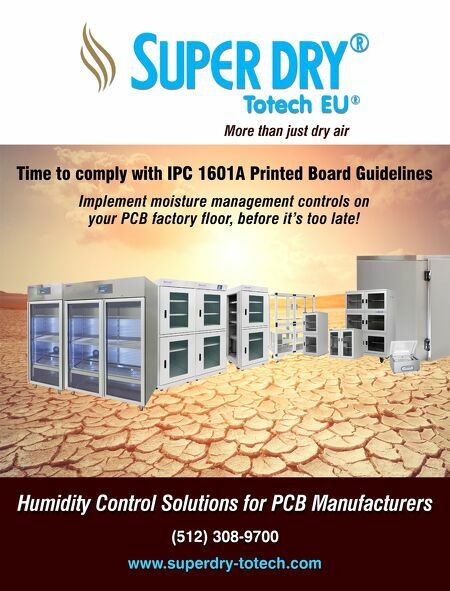 This trend is now being championed by the automotive industry to ensure highest re- liability within the gold wire bonding and sol- dering arena when employing the electroless nickel/electroless palladium/immersion gold (ENEPIG) process. Thick gold is typically considered to be in the region of 100 nm and, as such, tends to ex- acerbate some of the issues attributed to the current state-of-the-art immersion gold chem- istry at thicknesses of 70 nm. The plating char- acteristics of the established immersion gold processes are not wholly compatible with thick gold deposit requirements. The reason for the incompatibility is corrosion derived from the long exposure times that are necessary to achieve thick deposits. It must be stressed that thick gold is not always achievable with im- mersion gold systems. This is especially true if palladium is used as a wire bonding enhancer. In an immersion process the deposition rate will decrease over time as the deposition layer increases in thickness and density because the availability of electron exchange is reduced. In more extreme cases the source electrons can be limited to relatively small areas of weakness in the underlying deposit and cause exaggerat- ed corrosion events. This can be improved or overcome by employing an autocatalytic type of electroless gold plating system (Figure 1). Figure 1: A schematic comparison of the electroless gold deposition rates for immersion and autocatalytic systematic.